The hammock market is full of choices, however what most people don't know is that there are two main types of hammocks, those with spreader bars and those without. 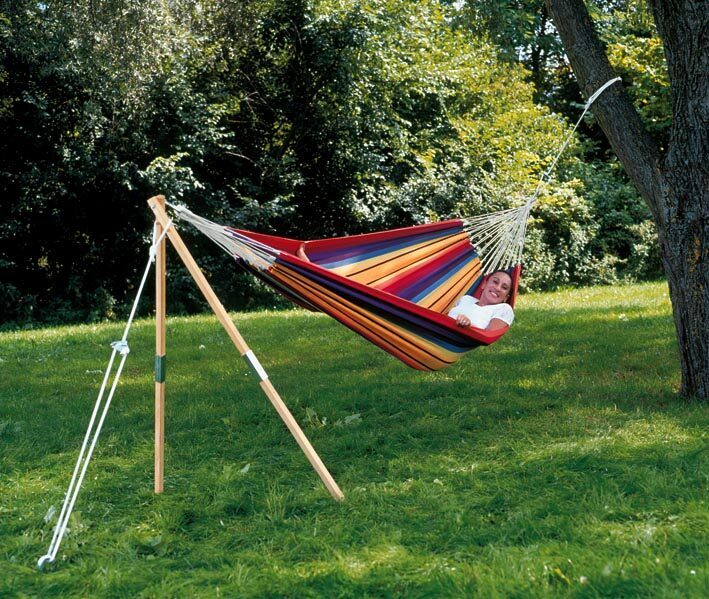 A hammock with spreader bars has bars either on one or both sides of the hammock. Those without spreader bars have more of a slope to them and need a higher hanging space. To decide which one you'll want, you'll need to decide where to place the hammock and then learn how to hang it! 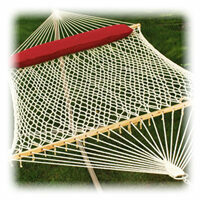 Made of traditional cotton or polyester, a rope hammock has a comfortable weave for relaxation. 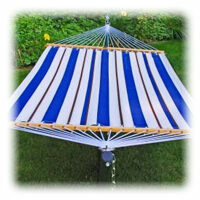 With solid or striped patterns, fabric hammocks are low maintenance and durable. Read a favorite book and relax with a single person hammock chair or swing. 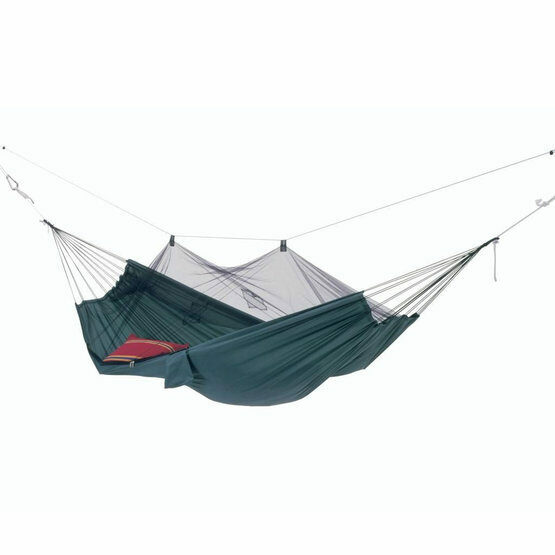 Lightweight and versatile for campers, camping hammocks are like tents that keep campers off the ground. Hammocks with Spreader Bars: If you are hanging a hammock designed with spreader bars, the recommended height off the ground is 4-5'. The minimum distance that is required for hanging a hammock with spreader bars is equal to the overall length of the hammock. If your hammock is 13' from hanging point to hanging point, then a minimum spacing of 13' is needed. If you need to hang your hammock farther apart than this, you can use either rope or chain to extend your hanging points. 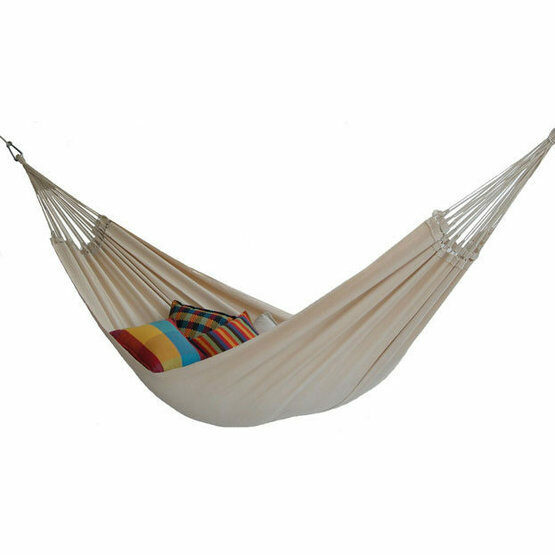 We recommend extending the hanging points in equal lengths on both ends of the hammock, and extending the hanging points no farther than an additional 18" on each end for a total of an additional 3'. 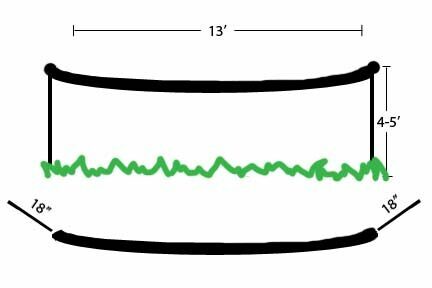 If you choose to add more than 3' of length, the tipping factor increases significantly. Hammocks without Spreader Bars: If your hammock does not have spreader bars, 6-8' off of the ground is the best height for hanging. Hammocks without spreader bars are typically more flexible in how they can be hung, and therefore can be adjusted to whatever space you have to work with. Camping hammocks usually come without spreader bars, making them easy to put up in a variety of settings. 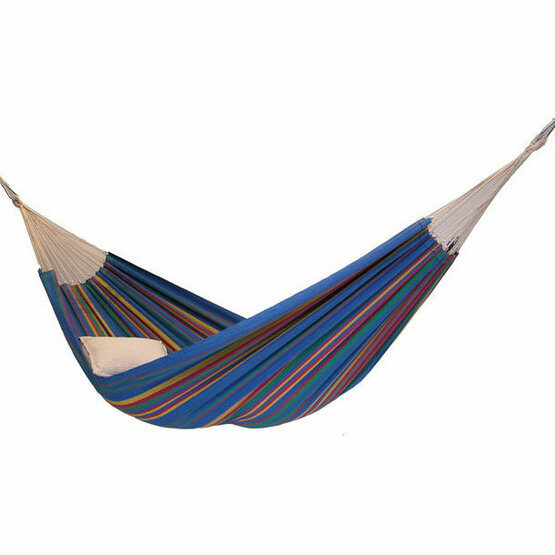 The minimum hanging distance for hammocks without spreader bars will be less than the overall length of the hammock because hammocks without spreader bars are designed to hang with a slump in them. Generally, the minimum hanging distance for hammocks without spreader bars is two thirds of the overall length of the hammock. 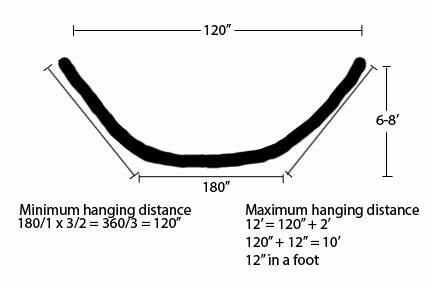 If your hammock is 180" between hanging points, the minimum hanging distance is going to be 120". To calculate maximum hanging distance add 2' to the minimum hanging distance. 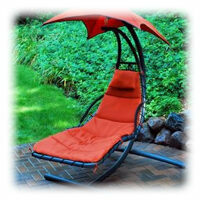 Hammock Chairs and Swings: If you have a hammock chair or swing, your hanging needs will be different. Read more about Hanging a Hammock Chair. Where to Hang a Hammock - It's all about Location! Now that you've purchased your hammock and calculated its space requirements, it's time to decide how to hang a hammock in your chosen location. Most people tend to think Hammocks can only be hung between two trees, but there are many other hanging options and types of stands for them. There is such a huge variety available, you are sure to find the hammock you dream of for any occasion or location you have in mind. Decide what you want from your hammock. 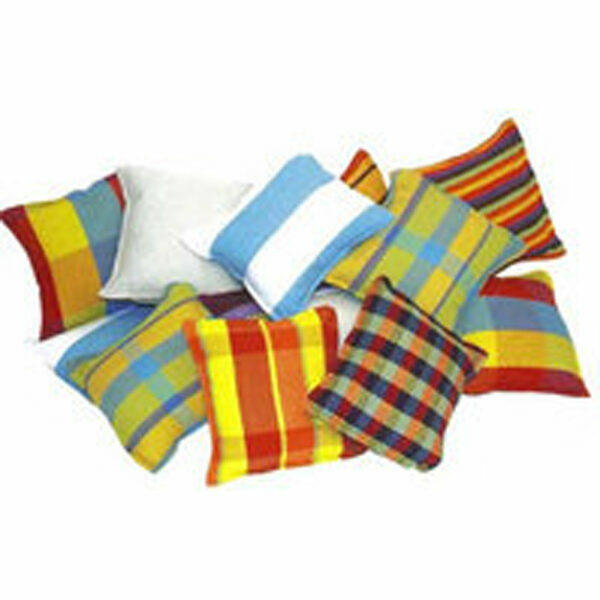 Do you dream of sleeping away a summer afternoon, or catching a breeze in the evening? Do you have an avid reader in the family who can spend all day in a rope hammock, but can't handle glare from the sun? Or do you want to work on a golden tan in the afternoons? Hammock stands allow you to move your hammock in and out of the sun as needed if you don't already have an ideal location between trees or hanging from a deck. Trees are great candidates as are posts for hanging Hammocks, but there are a good number of alternatives. 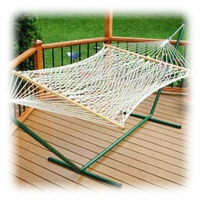 We also offer Hammock Hanging Hardware to allow you to hang your hammock from the ceiling, wall, or on a porch. Always be sure that the place you want to hang your hammock will support the weight capacity of the hammock.